BEA released new local area personal income data today for 2014. 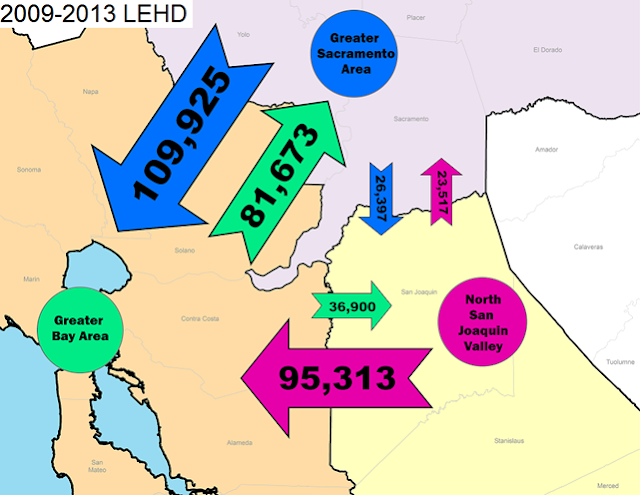 San Joaquin County had an above average annual gain. 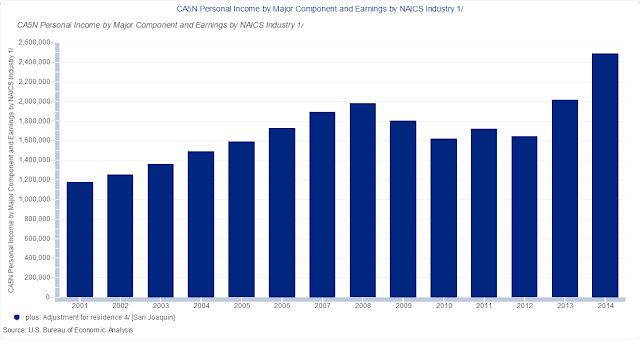 Looking at the breakdown among components and industries, the most notable item is a strong surge in net commuter income, called "adjustment for residence". This is a negative adjustment for places like San Francisco with more jobs than workers, and a positive adjustment for places like SJ County. Here is the graph for SJ County showing the large gains in 2013 and 2014. A strong piece of evidence that the Bay Area's strong economy is starting to spill over the Altamont pass. Comments on the Delta Tunnels environmental documents are due today. Here is a summary of my comments, which focus on two issues that severely bias the analysis in favor of the tunnels. The analysis is based on a project description that is widely known to be economically unviable due to its minimal water yields. 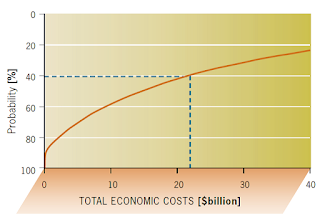 Because of the tunnels extreme cost, the intention to pay for the tunnels through steep increases to water rates, and the fact that the tunnels design capacity allows for much higher water exports; a complete project description must include a financial analysis that shows the proposed water yields are economically viable (especially for agricultural users). The lack of such a financial analysis and plan in the face of well-known questions about economic viability mean that the project description is at best incomplete, and at worst making false statements about intended levels of water exports in order to gain environmental approval. Investment in Delta Levees: Multiple assessments sponsored by the California Resources Agency have identified this as a viable, and in many aspects preferable, alternative to the Tunnels. Its total exclusion from RDEIR/SDEIS alternatives is unjustified. Increased Delta Flows and Reduced Exports for Environmental Benefits: This is the No Action Scenario DWR uses in previous economic analysis, and continues to argue is their expected outcome without the tunnels use when questioned on costs. But the RDEIR/SDEIS invalidly and inconsistently ignores higher flows in either the No Action scenario or alternative scenarios. Increased Investment in Alternative Water Supplies such as recycling, conservation, storm water capture, and desalination: Many water agencies have stated that they will increase investment in alternative water supplies in the absence of the tunnels. In fact this strategy is in the official resource management plan of some of the agencies, and water agencies have put forward economic analysis that describes much of the benefit of the tunnels as avoiding these obvious alternatives. Thus, it is inexcusable to exclude increased investment inalternative water supplies from the No Action and alternative scenarios. Move the Intakes Downstream to the West Delta: This is another obvious alternative that is ignored in the analysis. It would reduce environmental and socio-economic impacts in the Delta and potentially reduce costs to the water agencies by greatly shortening the lengths of the tunnels. While there are advantages to water exporters of being further upstream, there is no valid reason to completely exclude a full analysis of moving the intakes downstream. 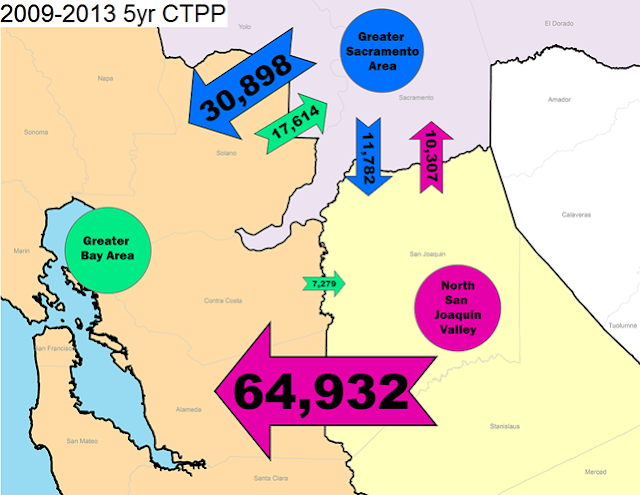 How many commuters are there between Sacramento and the Bay Area? Barry Broome has brought new energy to marketing Sacramento through the new Greater Sacramento organization, and a big part of his strategy appears to be aggressively targeting Bay Area firms. His favorite factoid is that there are over 100,000 Sacramento commuters to the Bay Area, and 200,000 going back and forth between the two regions. Since he started citing these figures months ago, I have received a number of inquiries asking if that number is correct. The figure popped up in two more stories this week (here and here). My answer is that it depends on how you define commuting. The best estimate of the number of people physically commuting is about 1/3 of the figure Greater Sacramento is quoting, and the largest destination for these Sacramento commuters is Solano County - which may be the Bay Area but is not Silicon Valley. As someone who spends a lot of time traveling between Sacramento, Stockton, and the Bay Area, I can attest from experience that the commuter traffic is much worse over the Altamont Pass to the North San Joaquin Valley than through Dixon to the Sacramento area. The Census Bureau estimates of commuting patterns, known as CTTP and shown below, back up this personal experience on the highways. But Greater Sacramento did not make up the number. The 100,000 figure comes from a huge dataset, known as LEHD, and as shown in the figure below, it offers a much different perspective on worker interchange between regions. LEHD is based on employer tax filings, matching the place of employment as recorded by employers to employees addresses. In contrast to the Census data, LEHD shows more Sacramento area residents have paychecks originating from San Francisco, Alameda and Santa Clara than Solano Counties. Another interesting difference between LEHD and CTTP is that LEHD shows much larger flows in the "reverse commute" from the Bay Area inland to Sacramento and the North San Joaquin Valley. While LEHD is in some ways a more detailed data set of economic connections, our Center has found it to have a lot of misleading information on work locations when trying to use it over the years and prefers the CTTP data, as do many transportation planners. LEHD administrative records do not always match actual work sites, and it also includes telecommuters who work from home, as well as construction workers, sales reps and others whose work location is constantly changing. As a personal example, my wife works remotely for a North Carolina based consulting firm, but hasn't actually been to the administrative office in a decade. She spends her day communicating with people in Florida, Seattle, and Pennsylvania about project sites located in New Jersey, Wisconsin, and Oklahoma. According to LEHD, she "commutes" from the Sacramento area to the Raleigh, NC area, not 15 feet to the home office. LEHD also shows me as a commuter from Sacramento to Stockton, but I mostly commute within the Sacramento area. Most people that I know in the Sacramento area who work for Bay Area employers are in similar arrangement, they only go to the Bay Area a few times per month - and work remotely, travel to clients and sites in various locations, etc. These people are economically connected to the Bay Area, even if they aren't physically moving between regions that much. But these additional workers picked up by LEHD that are not included in CTTP are not necessarily a workforce that would prefer a Sacramento employer to shorten their commute as they are sometimes marketed by economic developers. LEHD is a valid and interesting measure of economic connections, the flow of paychecks between regions, but it overestimates commuters. Thus, I would recommend taking the 100,000+ commuter figure with a pinch of salt. It is a count of Sacramento area residents receiving paychecks from Bay Area addresses. However, I think Greater Sacramento's overall message to market in the Bay Area and talking about growing inter-regional connections and partnerships are correct. I believe there is increasing recognition in the Bay Area that inland areas, both Sacramento and the North San Joaquin Valley, are going to have a larger role in the Bay Area's economic future - and that the relationship will be deeper than just commuters. The Northern California Mega-region will be emerging in the coming years as a more integrated entity. At it's next meeting, the Delta Stewardship Council (DSC) will be considering four draft Principles for Water Conveyance in the Delta contained within a larger statement of principles on conveyance, storage and operations. Considering that the proposed Delta Tunnels would be by far the most expensive water infrastructure project in California's history (construction costs currently estimated at $16 billion and rising), and cost is increasingly at the center of its controversy, it's pretty surprising to me that the DSC continues to ignore it. The omission is particularly noticeable since the DSC does not hesitate to focus on cost for other, much less expensive, water infrastructure like storage and levees in the same document and meeting. Here is my short summary of the 4 principles. Enhance ecosystem and reliably export water when it is available (the DSC's co-equal goals). Flexible to changing environmental conditions. Increase resiliency to risks of flood and earthquakes. Integrated with other projects, since tunnels alone don't do much for water supply. No mention of costs, just a list of benefits. And even this list of benefits is notably absent a valuation of these benefits relative to the costs of the conveyance improvement. Does it make sense to reject a project that only achieves 3/4 of the principles even if it is 10% of the cost of a project that goes 4/4? After all, we are mostly talking about irrigation water - it's not life or death. Some state officials try to duck the cost issue by stating that it isn't their business and it is up to the water agencies to decide if they want to invest in the tunnels. That argument naively assumes that there is no link between paying the Tunnels' mammoth costs and all of the other DSC goals that are explicitly their concern such as operations, reducing reliance on the Delta, ecosystems, water quality, investment in levee integrity, and more. Here are some constructive suggestions for edits/additions to these principles. Revised #4: Must have a finance plan that clearly demonstrates that the cost of improving conveyance will not adversely effect the ability of agencies to finance other integrated water management projects, including enhanced storage and projects that reduce reliance on the Delta. #5: Must have a finance plan that does not increase the incentive to export more water from the Delta. The plan must show that the project is cost-effective at levels of water exports that protect the Delta ecosystem. #6 Benefits beyond the co-equal goals (e.g. public safety, recreation, Delta as a place) are recognized and encouraged. One should never read too much into a single, relatively small event, but Roger Philips' story today about a San Francisco furniture designer moving from the Mission District to downtown Stockton is worth reading. Everybody is so impressed with Silicon Valley that far-fetched hopes for the tech industry often dominate economic development talk. But the best assets of Stockton, proximity to Bay Area markets with relatively low real estate costs, are not that important to tech industries who aren't sensitive to rents and sell to a global market. The tech industry has moved up the peninsula to even more expensive San Francisco. Much of the attraction is the art and cultural attractions of the City, and there is much concern in SF that the tech workers are damaging the City's cultural fabric as they drive rents into the stratosphere. I have long thought Stockton should focus its economic development on artists (broadly defined to include craftspeople, musicians, etc. ), since they are more likely to be attracted to what the city has to offer. They are sensitive to rents, and value access to the Bay Area market but do not necessarily have to live and work there every day. Stockton's history, diversity, and urban environment can also be a plus. These type of moves don't bring the number of jobs or millions in investment of the big corporate projects typically targeted. But they can make positive changes to the culture and identity of the city, and that will help attract higher-paying, higher-skill employers and workers down the road. So are these designers the start of a wave or just a small blip? I don't know, but Stockton's economic developers should do what they can to promote this scenario and build some momentum. Governor Brown has become an international leader on taking action to combat climate change, repeatedly calling business-funded opponents of such action "troglodytes." Thus, I found it surprising that the chief sponsor and promoter of the most broadly ridiculed and discredited report opposing California's climate change policies was the author of the rebuttal of my recent op-ed criticizing the economic rationale of the tunnels. The Small Business Association's infamous climate-change report predicted that implementing AB 32 would create an economic doomsday that would permanently erase 1.1 million jobs, and cause a 26% decline in discretionary spending by California households among other ridiculous findings. The report is a prime example of why Governor Brown calls his climate change opponents "troglodytes", and it was universally and very publically blasted by academic experts, and even the LAO. In this pro-tunnels Sac Bee op-ed, Ms. Toccoli, the long-serving President of the California Small Business Association, once again shows an inability to interpret an economic report, a lack of understanding of environmental projects/policies, and a taste for bogus, doomsday economic scenarios. Here is a look at the 4 "facts" she uses to support the tunnels. "a guaranteed future of diminishing water supplies if we fail to act. According to economist David Sunding, without a new conveyance system, if wildlife agencies impose continued or even greater flow restrictions to protect fish, we could lose more than 1 million acre-feet of water supply a year." Wrong. Dr. Sunding's scenario was intended to capture the benefit to water exporters of the regulatory assurance from the BDCP's proposed 50-year permit that was the hoped for result of the combined conveyance and habitat restoration plan. It does not stem from building the tunnels as she claims. It's irrelevant now, because the revised Water Fix plan does not include this element. The water exporters have no regulatory protection from an increase to flows that may be needed to protect fish, even if they build the tunnels. It is well known that they are extremely concerned about this important change that Ms. Toccoli dismisses. "The total cost of disruption to our water system would cost the economy $30 billion to $40 billion over five years – more than twice the total construction costs of the pipelines." Wrong on multiple levels. First, I will point out that the report she authoritatively cites in her first argument, estimated the cumulative avoided costs of the earthquake scenario at $400 million over 50 years, 1% of the value Ms. Toccoli uses. And unlike regulatory assurance, the amount of earthquake protection is something that is unchanged between the 2013 BDCP proposal and the 2015 Water Fix. That means Sunding's report is a current source for valuing earthquake protection, but outdated on water yield and regulatory protection. Here is the source she is using to support her claim of $30-40 billion in costs. She assumes a ridiculous 6 year disruption. Even DWR says it would be "weeks or months" which is the far left corner of this graph where the costs in billions are low single-digits and hard to distinguish from zero in some cases. She assumes the tunnels protect from all of these costs. In fact, DWR's documents show exports would still decline by about 50% with the tunnels in place, so the tunnels only protect against about half of these costs. She uses the top-line economic impacts, when the lower bottom set of lines, economic costs, are the appropriate measure to use for comparing to the cost of the tunnels. Her 68% probability of a catastrophic 20+ island flood over the next 25 years is inflated too, although it is often cited as the probability of a large quake in the Bay Area that could damage delta levees. Rather than plucking numbers out of context from obscure reports that she does not appear to understand, I recommend using a common sense comparison to other water surface-water shortages. In the unlikely event of a Delta-destroying earthquake flood, the tunnels would protect 50% of Delta exports for a period of weeks or months according to DWR. That's a shortage of about 1 maf of surface water supplies, a significant shortage, but one that the state already has plenty of experience managing. In fact, it's only about 10% of the loss of surface water supplies in the current drought, and the economy still grows robustly. The disaster talk to water supplies sounds much scarier than the reality. We should be more focused on water shortages from an extended drought (a scenario where the tunnels do little to help), and less afraid of water shortages from a Delta earthquake. And like most tunnel proponents, Ms. Toccoli callously ignores the death and destruction in the Delta itself from the disaster scenario she is hyping for water exporters. Seismic levee upgrades would actually offer more protection for water exports than the tunnels, and would save lives and other vital transportation, energy and water infrastructure that benefit her small business supporters. Why keep pushing expensive and divisive tunnels instead of a lower-cost, win-win alternative? Third, she makes a claim about wet year water exports that is mostly a repackaged version of the invalid first argument. The wet year yields described in the EIR/EIS are not as large as she claims. It is just a repeat of the argument that the tunnels benefit water exporters because they are hoped to stave off more environmentally-protective operating rules in the future. As I have pointed out previously, this line of argument directly contradicts the EIR/EIS. Fourth, she makes an inaccurate comparison to the costs of alternatives. 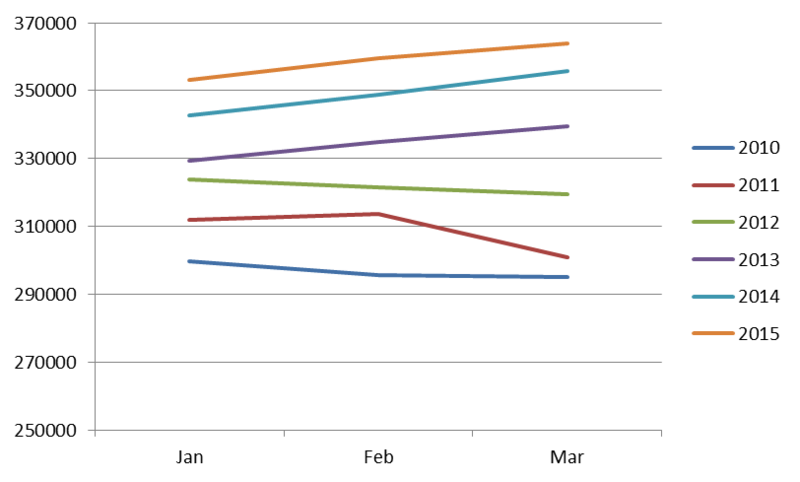 A comparison of various alternatives shows the relative affordability of California WaterFix. The cost of water will be approximately $1,000 per acre-foot for Southern California and less than $500 per acre-foot for Central Valley farms. A recent recycled water project in San Francisco came in at more than $8,000 per acre-foot, while the Poseidon desalination plant in San Diego comes to more than $2,200 per acre-foot. Wrong again. A consistent and correct comparison focuses on the incremental or marginal costs of alternative projects. Ms. Toccoli's figure averages the cost of the tunnels across all 4.9 maf of expected exports after the tunnels are built, including spreading the costs over the roughly 4.7 maf that water exporters would receive anyway. The San Diego desalination plant is 100% new water supply to the system, all 56,000 af of yield is an incremental new supply. A valid comparison to the tunnels, only looks at the new incremental water yield that results, which is a little over 250,000 acre feet according to the EIR/EIS. Veteran water economist Rodney Smith published a handy table that shows the cost of water from the tunnels under various assumptions of incremental water yield. At the yields in the latest EIR, the tunnels water supplies are over $3,000 per acre foot. Not only are the tunnels more expensive than desalination, their water supply is less reliable, lower quality, and hundreds of miles away from where it would be used. Of course, the choice isn't really tunnels vs desal, but tunnels versus myriad alternatives including fixing leaking pipes, recycling, stormwater capture, groundwater clean-up, and conservation that the state has not come close to fully developing. 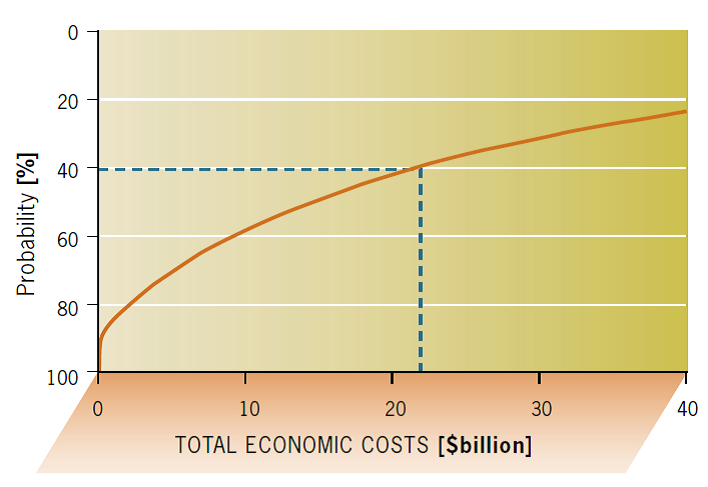 Desalination is the most expensive alternative, and used for comparison only to highlight the tunnels' extreme cost. The article wraps up with the $5 per month ($60 per year) cost which it describes as "a pittance." That will only pay for Metropolitan Water District's 25% share, and is hardly a pittance to many households. The tunnels will cost some irrigation districts hundreds of millions of dollars each year, and there are individual farming operations that could be on the hook for a million or more each year. The word pittance best describes the tunnels' contribution to the State's water supply, and its cost is best described as by far the most expensive and risky water supply investment in the State's history. Ms. Toccoli is a savvy political player with a lengthy history of political advocacy which includes passing out coveted business endorsements to Democrats. I don't know about her positions on other issues, and perhaps she is a positive factor in other discussions. But her inaccurate forays into economic analysis of environmental issues have distorted serious policy debates, and are ultimately unhelpful to the small business interests her organization represents. "It's not a question of 'Do I want 5.2 (million acre feet) or 4.9?" Cowin said. "It's a question of 'Do I want 4.9 or 3.5 or 3, or shut down the facilities altogether over time?'" Really? You just released the official Environmental Impact Statement that clearly describes the question as a choice of 4.7 - 5.3 million acre feet with the tunnels, and 4.7 million acre feet without the tunnels. According to the EIS, the average expected water yield (increase to exports) with the tunnels is only 257,000 acre feet, and it is clear that the $15+ billion investment offers a terrible return on investment to water exporters in that case. Cutting exports to 3.5 or 3 is the proposal of the most intense environmental activists, the "Responsible Exports Scenario" that they have been demanding be analyzed in the EIS/EIR and the Delta Plan for years. The State has ignored them, and yet the DWR Director is making public statements that this is in fact the outcome if the Tunnels are not built - never mind what it says in their EIR/EIS. Not even the most extreme environmentalists are asking to shut-down the facilities all together, and yet the DWR Director suggests it will happen if we don't build the tunnels. Back when the Bay Delta Conservation Plan was seeking 50-year regulatory assurance, there was some justification for using an alternative no-tunnel baseline when evaluating the project's return on investment to water exporters (but not for statewide benefit-cost analysis as the regulatory assurance was not risk-reduction, it was risk-shifting from exporters to upstream users, taxpayers and the environment). With the regulatory assurance now eliminated from the project, how can Cowin keep making this argument to the exporters? As the article notes, many of them are unconvinced by the increasingly hard-to-believe sales pitch. Director Cowin is in a bind. The State must use a different no-tunnel scenario for its economic case than its environmental case, but it is this constantly changing story that causes immense distrust in both the agricultural and environmental community. It is also going to cause major problems for the project when the EIR/EIS is litigated. I suppose he has no other choice, as long as the Governor is still strongly pushing the delta tunnels. The tunnels are simply a bad project. A good project can get a passing grade using the same no-project baseline scenario for both environmental and economic analysis. The dramatically shifting no-tunnel baseline violates basic principles of objective scientific and economic analysis, and contradicts the statements that the project is governed by the "best available science". The rest of the Sac Bee article features quotes from the reporters' tour of the Central Valley asking various farm leaders about their willingness to pay for the tunnels. Kasler and Sabelow summarize the responses as "The answer, so far, is a very qualified "yes." That is an accurate description of their public statements, but there are good reasons to believe that their assessments and their statements are a lot more negative when there are no reporters in the room. The reporters should stay on this story and dig deeper. Finally, I was moved by this quote form Jim Beck, general manager of the Kern County Water Agency. "Think about the magnitude of that decision for these farmers and their families. It's the most significant decision most will make in their careers." I honestly feel for these farmers. They want action and have historically supported big water infrastructure. But they have never had to finance anything close to this magnitude, and they are now under tremendous political pressure to support a project that is bad for them economically and will especially harm their kids and the next generation that is stuck with the bill. Like many others, I believe that the footprint of Central Valley agriculture will shrink by 10% or more in the coming decades due to dwindling supplies of ground and surface water. But I am also optimistic, and think Valley agriculture will continue to grow more profitable overall even as it uses less land and water. The tunnels will make Valley agriculture less profitable in a desperate attempt to stave-off a loss of acres. At the EIR/EIS water yields, the tunnels will keep 60,000 marginal acres in production in the long-run. Is that worth $10 billion (the ag share of the tunnel bill)? That's $160,000 an acre. It doesn't make sense - even with $4 almonds. Even if you use DWR's poorly justified, high-water yield scenarios, it is $30,000 an acre, and farmers are still better off fallowing the most marginal land. According to CoreLogic, the percentage of mortgages 90-days or more delinquent in the Stockton area is now down to 2.24%, pretty close to historic normal rates of 2%. Five years ago, 20% of mortgages were 90-days delinquent during the peak years of the foreclosure crisis. At that time, some economists were talking about whether there could be a "squatter stimulus" in the local economy, meaning that some local households actually had more disposable income because they weren't paying for housing. Those impacts were never large, but it is just remarkable how much the conversation has changed in five years. It's not surprising, in fact its what we predicted. But it still seems strange to be talking more about the lack of affordable housing than the foreclosure crisis. While foreclosures and delinquencies recede to normal levels, it doesn't mean the impacts of the housing crisis are in the past just as Stockton's emergence from bankruptcy protection does not mean the city governments financial challenges are in the past. Nevertheless, the latest data on foreclosures and delinquencies is a very welcome sign of progress. The tunnels' PR campaign and some state leaders, including Governor Brown, talk about the catastrophic delta flood scenario as if the only consequence is water exports. Given that the direct devastation of such an event would be in the Delta itself, there are some serious economic and moral problems with this argument that should be raised given it is the main argument made for the controversial tunnels. The source usually cited by tunnels advocates for the earthquake risk is the DRMS Phase I study which assessed flood risk and consequences in the Delta. Its assessment of levee failure probabilities was highly controversial but I will ignore that debate here, and focus on the consequences analysis. The report described the consequences as follows in the fourth sentence of its executive summary. "Levee failures and the flooding that follows can cause fatalities, destruction of property and infrastructure, interruption of a large portion of California's water supply, environmental damage and statewide economic impacts." The first thing it mentions is fatalities, the second is property and infrastructure destruction in the Delta, and the third is water supply. The DRMS authors put that list in the proper order, as public safety is typically given the highest priority in risk-assessment and the DRMS analysis found that the economic loss to property and infrastructure exceeded the economic loss from interrupted water exports. 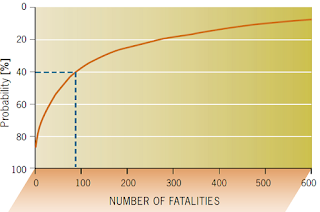 Here are the Figures from the reports' executive summary that outline the public safety and economic costs. For comparison, Katrina killed over 1,800 people and caused hundreds of billions in economic losses. The 1989 Loma Prieta earthquake in the Bay Area killed 62 people and caused over $6 billion in structure damage and more in total economic costs. DRMS describes a horrific scenario that could be worse than Loma Prieta and smaller than Katrina, but with a similarly devastating mix of fatalities and economic costs. However, the public discussion of the Delta scenario is driven by water exporters and focuses almost exclusively on economic losses, whereas discussion of these other events have focused much more on life loss and public safety. In recent years, I have heard informally that subsequent modeling has shown that shut-down of the export pumps in this Delta flood scenario are more likely to be weeks or a few months, rather than years that are more often heard in the media. DWR Director Mark Cowin has recently said weeks and months. I am aware of this presentation to BDCP from a few years ago that supports weeks and months. 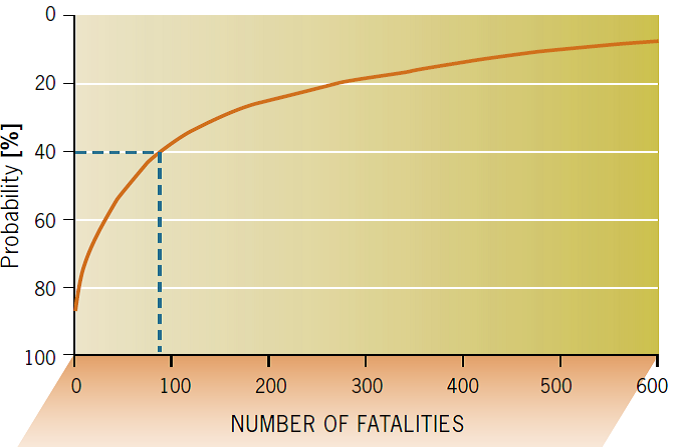 I am not aware of any more recent analysis of fatality risk. Perhaps that would decline in a more recent assessments as well - especially if the levee failure probabilities have been reduced to account for the lower frequency of floods seen in the past decade and levee and emergency response improvements. However, it should be noted that the fresh water inflows which reduce the length of water export outages in some cases could still be just as devastating to lives, property and infrastructure in the Delta. In this recent Bee op-ed, my language on this issue was probably too strong, and I would have toned down my earthquake statement if I had known the Bee was going to use it as a call out subtitle. But this earthquake, salt water, shut-down the pumps argument has once again become the principal case for the tunnels' made by many state political and business leaders. If that is the main argument, then it needs to face more tough questions about its economic, technical and ethical merits. 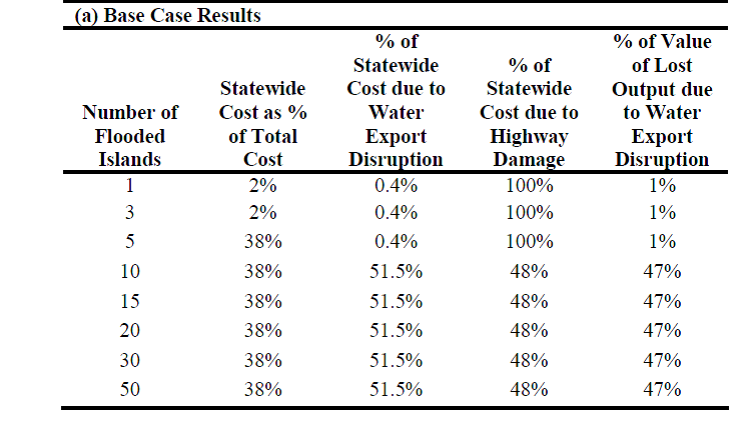 I realize I failed to include a graphic that shows DRMS found water export interruption was only 20% of the cost. It is tedious to tabulate this from the appendices, but it is relatively easy to derive from this table from DRMS Phase 2 report (taken from Table 18-2). 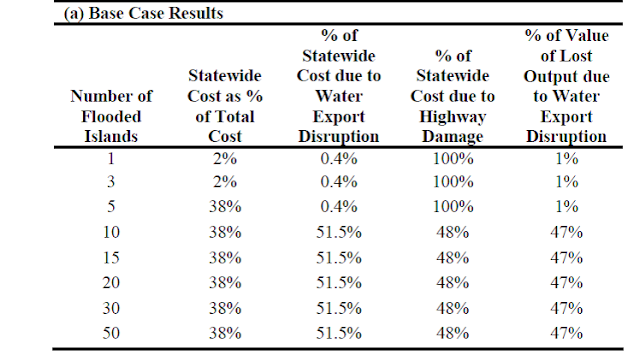 The table shows that these two types of costs it categorizes as "Statewide" (water export interupption and state highway damage) are only 38% of the total cost from the mass flood scenario, and that water exports is only 51.5% of this 38% share. Thus, water export interruption is 19.6% of the total cost (.515*.38). Today, the Sacramento Bee published an op-ed by me on the economic benefits and costs of the Delta Tunnels. As always, word constraints limit what you can see in an op-ed. This post expands and clarifies a few things. Financing the Tunnels. The op-ed focuses on economic benefits and costs, and doesn't discuss some of the serious problems with financing the tunnels. Without going into details, these are myriad and deserve a separate op-ed of their own. Most notably, farmers would have to pay the majority of the tunnels' cost because they receive the majority of water exported from the Delta. It is highly unlikely that the agricultural agencies can pay their share, meaning costs will have to be shifted to urban agencies or general taxpayers. Even if the agencies could somehow make the payments in an average year, how would they do it in a drought when they are receiving no water from these tunnels? The plan quotes costs on households in Southern California at $5 a month - that calculation is a few years old but assumes that farmers are paying as much as 75% of the Tunnels' cost. That's not going to happen. You can count on costs being shifted to urban ratepayers, local property taxes or general taxes because it simply won't fly any other way. Water Supply: I hope no one thinks I am advocating a bunch of desalination plants is the best alternative to the tunnels by choosing this comparison to a current, very high cost source. And yes, I know that energy costs are high with desal, but the energy requirements aren't much different than pumping Delta water hundreds of miles and over mountains to LA and San Diego. I also could have compared them to new reservoirs. The much criticized Temperance Flat has a projected water yield of about 70,000 af for a capital cost of at least $2.5 billion. Yes, even these dams have a better water yield bang for the buck than the Delta Tunnels, but nobody pretends that water users could pay for them. In fact, there are serious financial viability questions about these Dams even if general taxpayers pay the majority of the costs through the Water Bond and various sources. Finally, I could point to Rod Smith's old blog that calculated the cost per acre foot per water yield. Without the regulatory assurance in the Tunnels plan, it is pretty clear that the estimated water yield is only 257,000 af. Using Rod's handy table, you can see the water cost of the tunnels is about $3,000 af assuming no risk premium. That's almost 50% more than desal, for less reliable supply. And the cost is orders of magnitude higher than other alternatives like recycling, conservation, and stormwater capture, and is also orders of magnitude higher than what farmers could afford to pay (their profit per acre foot). Seismic Risk: The Mark Cowin comment about weeks and months, not years, was a direct quote from his prepared statement for a media call as transcribed by the remarkable Maven. It would be nice if the Governor would be so careful in his remarks on this subject. The fact that the outage would not be as long as claimed seems to be one of those things that "everyone knows". But this isn't my area, so the only reference I have is this presentation from a BDCP meeting a few years ago that Bob Pyke conveniently posted for the benefit of people like me. Previous BDCP analysis shows exports from the Tunnels would be about 3 maf per year if the south Delta pumps were disabled, so that would be the benefits to the water exporters in the very unlikely case an outage lasted a full year. So the loss the State's surface water supply would be about 1/4 the current drought (more in some areas very dependent on Delta exports), but it is not something that would destroy the economy the way the Tunnel advocates rhetoric claims. The current drought shows the State's economy can do just fine in the face of more severe shortages. The loss of life and only 20% of economic damage from loss of water exports comes from the State's DRMS studies. You won't find it in the executive summary of those studies, you have to compile the data from their consequences analysis the way we did in the Economic Sustainability Plan. That finding was thoroughly vetted. It's also common sense. The Delta is not urbanized, but there is a lot of important stuff out there - including inter-regional highways, gas wells and storage, pipelines, inter-regional power lines, farmland, and people's homes. If we need to reroute the water canals around the Delta due to flood risk, what about the highways and power infrastructure. Rerouting and elevating these would cost billions more even if we could figure out a route. Fixing the levees to protect everything together makes a lot more sense. And I haven't even mentioned public safety. I am not one to make moral arguments, but I think this constant discussion of a Delta flood without even mentioning the catastrophic impacts in the Delta itself - including significant life loss - is disgraceful. The value of regulatory assurance: The Governor calls it a "technical change" but it is a very big deal to the economics. Here is my very first post on the subject written when the BDCP rolled out the argument that regulatory assurance was the reason water agencies should pay tens of billions of dollars on a project with such minimal water yield. One thing to note in the post is that all of the science experts I consulted on this theory at the time told me the regulatory assurance claim was fictional as it would never get regulatory approval. It is now clear that my sources were right about that. On the media call, Mark Cowin mentioned that they might have some new economic analysis coming out next month. It will be interesting to see if they come up with anything new to find more benefits. I don't think they can, and I expect people to be very skeptical of any new benefits that miraculously emerge at this late point in the process. It was hard not to think of Attorney Patrick Soluri and his clients after watching John Oliver's hilarious take on public financing of professional sports stadiums. These Sacramentans didn't need a pep talk from a comedian to inspire them to take the City to court over the financing of the Kings' arena. I have reviewed a number of documents surrounding Sacramento arena financing and this specific case in recent years, and I have mixed feelings about it. Like John Oliver (a comedian making a serious point) and virtually every serious economist, I believe these publicly financed arena deals are usually bad policy - often by the cities that can least afford them - and the economic development benefits are typically overblown while the budgetary costs are understated. There should be a lot more questions of the politicians and team owners who orchestrate these deals. Unfortunately, it seems there are a lot more accolades and parades (and apparantly a glowing ESPN documentary in Kevin Johnson's case) than tough questions. But this lawsuit goes beyond tough questions and alleges a fraud on the public, primarily by giving the Kings' rights to electronic billboards and a downtown parking garage without making a proper valuation of those assets. I would agree that the City's presentation of this part of the deal is deceptive and understates the value that is given away (the city staff that said billboard rights are "only" an opportunity cost since the City general fund is not currently receiving this revenue should be suspended without pay and enrolled in ECON 101). But hold on, the Kings' also contributed substantial items to the deal that weren't given an economic value either - to name one big example - the Kings' taking responsibility for all cost overruns is hugely valuable - and that is already paying off. It seems to me that Mayor Johnson and the City were trying very hard to keep the city contribution at a face value of the $258 million since this matched the previously approved deal for the railyard arena under the Maloofs' ownership. It is probably true that they hid the value of some things to keep the contribution at that number. But as I mentioned before, there were unvalued changes on both sides of the ledger. Notable changes on the cost side include the electronic billboard rights and the downtown garage as the lawsuit points out. On the benefit side, the new Kings owners took responsibility for cost overruns, and arena lease payments to the City were modified to fixed amounts rather than convoluted structure in the Maloofs' deal that had a lot of risk for the City. The arena was moved to the blighted downtown Plaza - where it will provide a lot more value to the City's revitalization efforts. My opinion on this arena deal hasn't changed. The City's new arena deal with Ranadive's group is better than the deal the City had with the Maloofs. I opposed the Maloof deal, but moved my position to neutral on this one as a result of the improvements. I am cautiously optimistic about it catalyzing positive change in downtown Sacramento, and it may prove worth the costs. My larger concern is that the Arena deal will lead to a larger erosion of budget discipline by the City. The arena subsidy does impact its general fund, and it means the City can afford to spend less than it could in the absence of the Arena. But the City Council recently approved budgets that spend beyond the City Managers recommendation, and they are now encouraging a vision for hundreds of millions of dollars for a new performing arts center when a few years ago they couldn't afford a renovation. And there are probably more requests coming all the time, because it is politically much harder for electeds to say No after saying Yes to subsidizing a basketball palace for millionaires. July 24 Postscript: The judge ruled in the City's favor today, rejecting the claims of fraud. While I would not go quite as far as the Judge in some of his criticism of plaintiff's arguments quoted in the Sac Bee's article, I think he is correct that there is no fraud here. In fact, I think the City's leader listened constructively to some of the criticism of their deal, and that Sacramento's arena deal actually got better for taxpayers with each iteration of the plan, whereas it seems so many big public projects these days see the costs to the public grow while the benefits shrink as they progress (i.e. Bay Bridge, high speed rail, Delta tunnels). The Department of Water Resources did not release any revised cost estimates or economic and financial analysis Thursday with the revised EIR for the Tunnels. However, I saw three changes in my initial review that have significant economic effects, the first of which has already been revealed and discussed. The new plan drops the 50-year permit, and any notion of regulatory assurances about future water deliveries. This change has already been revealed and discussed, but its importance to the economics can not be understated. According to the State's BDCP consultants, the regulatory assurance was the basis for over half of the economic value of the Tunnels to the water exporters' who would finance them. As I have discussed repeatedly (see here, here, and here for examples), the already flimsy economic case for the Tunnels completely falls apart without the regulatory assurance. It drops the estimated benefits by nearly $10 billion. The average annual incremental water yield with the tunnels compared to "No Action" has dropped by 135,000 acre feet(af). The 2013 EIR (table 5-9) had 4 scenarios with an incremental yield that ranged from a loss of 27,000af to a gain of 821,000af, and an average gain of 392,000af across all 4 scenarios. The new EIR has 2 scenarios with an incremental yield ranging between a loss of 23,000af to a gain of 537,000af which is an average gain of 257,000af. Thus, the best case scenario for water exporters dropped by 284,000 af, and the average dropped by 135,000 af. That loss of water yield would drop benefits by about $1 billion. The new plan shows the estimated construction period has grown from 10 to 14 years. It's buried in the Appendices (see here and here), but the construction period is now described as 2016 to 2029, compared to 2015 to 2024 in the 2013 plan. An extra 4 years of waiting to receive any economic benefits (while accumulating financing costs) will further reduce the benefit-cost ratio. In 2012, I estimated the net benefits of the Tunnels' as -$6 billion. In 2013, BDCP consultants estimated +$5 billion. Virtually all of the $11 billion difference was driven by differing water yield estimates that were entirely due to the regulatory assurance (50-year permit) assumption. After these changes, I think my -$6billion from 2012 looks overly generous, and something like $-8 billion in net benefits seems more likely. I should also mention a few other changes in the EIR that could have marginal economic effects. There are some changes to the water quality modeling that could be a significant issue for the environmental permits, but I suspect will have little impact on the project economics. 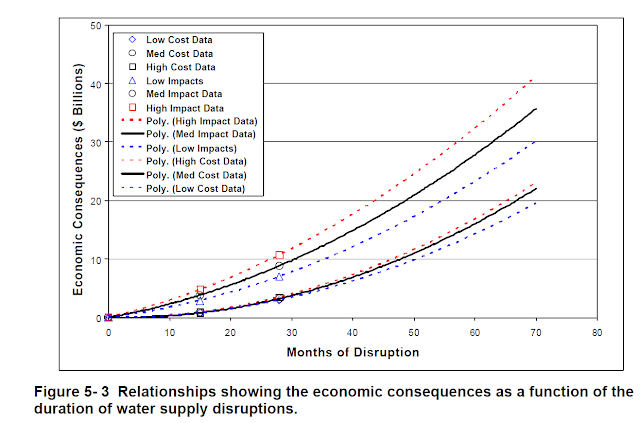 The design changes to the North Delta intakes marginally reduce negative economic impacts in the Delta, but are unlikely to significantly impact the overall project economics unless it significantly changes the estimated cost. The project just keeps getting worse for the water exporters. If the water agencies' leaders were really looking out for their ratepayers and the best interests of the state, they would drop it. But they won't, although some are starting to waver in their support. I will save my thoughts on why they keep standing by this lousy project for a future post. Farm jobs in the San Joaquin Valley declined significantly in the 4th quarter of 2014 compared to the same period in 2013, according to data from the Quarterly Census of Employment and Wages (QCEW) released today. The QCEW is a census of employer tax filings, and is a very reliable estimate of employment. 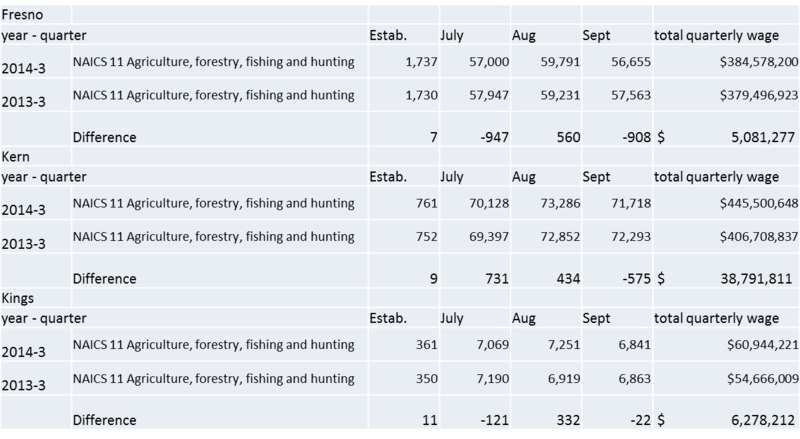 The table below shows the total of monthly agricultural employment (both direct farm employment and agricultural labor contractors) across the 8 counties classified as the San Joaquin Valley. The decline in employment exceeded 2% in each of the last 3 months of the year, in contrast to increases at the beginning of the year. The annual monthly average shows a loss of 513 jobs, or -0.3%, in contrast to earlier estimates of a modest gain. When this recent trend is combined with larger water shortages in 2015, it suggests that a significant decrease in agricultural employment should be expected this year. Farm employment in the Valley remained near an all-time high. Total agricultural wages were up nearly 4% compared to the previous year. Overall employment continues to grow in the San Joaquin Valley, and unemployment has declined to single-digits in most of the Valley, and is significantly lower than its historic average in most of the Valley despite the drought. In contrast, both farm employment and wages decreased 3-4% during a less severe drought in 2009, which was the basis of predictions of greater losses in 2014. The leading explanation for the smaller than expected loss in jobs is the shift to higher value crops, and while that is certainly part of the explanation - that shift was already well underway in 2009. How much has Cap and Trade Increased the Price of Gas in California? My parents are visiting from Ohio, and a favorite topic of conversation on these visits is what is more expensive here than "back home" and how much. While driving past a gas station with my Dad this weekend he suddenly whistled, "Whoa, it's $2.59 at home, that's the biggest difference I have ever seen. What's going on?" I mentioned that we now have AB 32 (cap and trade) covering motor fuels, and that the most quoted studies predicted about a 10 cent increase per gallon, but I haven't studied it in detail. That conversation led me to conduct some in depth research on Gas Buddy, which generated the following chart comparing California and Ohio. I looked going back 8 years, and it looks like the historical difference is 25-50 cents per gallon with the gap being larger in the summer. So far in 2015, it looks the difference has been 50 cents to a dollar with the current difference being about 75 cents a gallon. Dad was right. The data is volatile and it is a little premature to draw conclusions, but it looks to me like the AB 32 effect is about 25 cents per gallon. I seem to recall predictions that a price of about $10 per ton for carbon emission permits would translate into about 10 cents per gallon. So far in 2015, the carbon price has been $12-13 per ton, so the gas price increase/gap seems higher than expected. I wonder how the cap and trade revenue being collected by the state compares to the increased amount California drivers are paying for gas. I am sure there are many people who are properly researching this issue, and we will be hearing a lot about it in the months and years to come. Sacramento Performing Arts Proposal Keeps Growing. Is Arena Fever Affecting the City's Fiscal Discipline? When asked about the Sacramento Arena's public subsidy, I sometimes mentioned that some of the fiscal risk was indirect: subsidizing an entertainment center makes it harder for a City to say "No" to other long-term financial commitments - whether that is requests for other facilities or employee contracts - as well as deal with its unfunded liabilities. A task force exploring the need for a new performing arts center in downtown Sacramento has identified four potential sites for a 2,200-seat theater, but needs up to six more months to figure out how to pay for what would likely be a $200 million project. During a hearing with the City Council on Tuesday night, task force members said they had determined that replacing the aging Community Center Theater would help the city compete for the musical and performance acts that are beginning to be lured to more modern sites in Davis and Folsom. Mayor Kevin Johnson and the City Council directed city staff to work with the task force over the next six months to develop financing options, investigate locations that are under consideration, put together design plans for the theater and begin the process of requesting proposals from groups to operate a new theater. Garry Maisel, president and CEO of Western Health Advantage and chairman of the theater task force financing committee, said the project’s funding would likely be a “complicated puzzle” of public and private sources. He raised the possibility of a sales tax measure on the 2016 ballot to fund regional arts groups, as well as using state economic development loans or the city’s hotel tax to help cover the costs.Private sources include naming-rights deals, corporate sponsorships and individual donations. The Mayor's Performing Arts Theater Task Force director, Richard Rich says a new building would benefit the city more than a renovation of the existing Community Center Theater. "We can do as little as possible and spend tens-of-millions of dollars to take a deeply-flawed situation and make it slightly less-flawed or we can embrace the renewed spirit that this city has and we can give our citizens a center that reflects their pride in the city." Richard Lewis, the executive producer of the California Musical Theatre, said the $50 million project – which would include improvements to the theater’s seating, restrooms and loading docks – would represent “not a 10-year fix, but a 30- to 50-year fix, in my view. P.S. 4/30: Personally, I have bought more tickets at the Community Center theater and Mondavi Center than Kings games, and would enjoy a new theatre in Sacramento. However, the City Council's decision to subsidize the Kings' arena means that Sacramento is less able to afford the performing arts project than before, not more. Developing a viable financial plan may be an insurmountable obstacle for the project, but the tone of the conversation is makes me afraid that arena-fueled economic optimism threatens to cloud the City's overall fiscal planning. Does Cheap Community College Create Negative Incentives for High School Students? With President Obama proposing free community college, perhaps it seems strange to wonder if California's two-year schools are too inexpensive. California has the lowest CC tuition in the nation by far, and the biggest differential in tuition between 4-year and 2-year schools. The state provides a strong financial incentive for its high school grads to attend 2-year schools, and they respond in large numbers. Among the 20 most-populated states, California ranks 19th in the share of recent high school graduates that go to a four-year college — public or private, anywhere in the United States. In 2012, only a third of California high school graduates enrolled in a four-year college within a year of graduating from high school, compared with about half of high school graduates in Massachusetts, Ohio, Florida, Georgia, Indiana, New Jersey, Wisconsin and New York. Among the 50 states, California ranked 47th. In contrast, California ranks first out of the 20 most-populated states in the share of recent high school graduates who go to a two-year college (and ranks fifth among all 50 states). State funding reflects this focus, with California’s community colleges commanding an increasing and now majority share of state allocations — 54 percent — to the three public systems (UC, CSU and the community colleges). Clearly, community colleges play a very large role in California’s higher education system. The problem? Low completion rates. 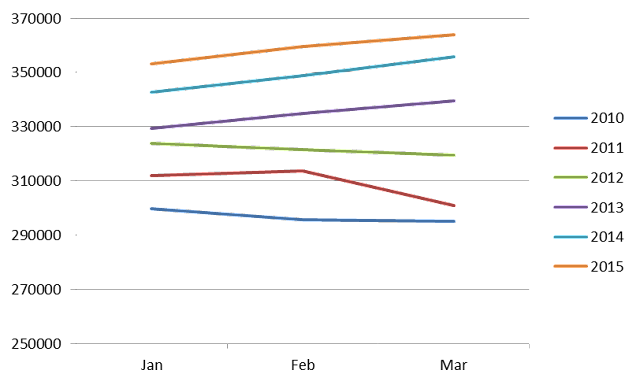 Substantially less than half of students who enter community colleges with the intent of transferring to a four-year college successfully do so. Research has shown that students are much more likely to earn a bachelor’s degree if they first enroll in a four-year college rather than a community college. California looks more like the President's proposal than any other state. However, numerous reports show the educational achievement of California's residents - especially young adults under 35 - is falling relative to the rest of the nation and world, threatening the state's future competitiveness. From California's experience, it isn't clear to me that making college degrees more affordable with financial incentives to start at a community college will lead to better educational outcomes. Certainly, affordability is a barrier to higher educational achievement, and that is deservedly getting a lot of attention these days. However, the evidence shows that poor high school preparation is also a strong barrier to college completion. And as Johnson notes, students who begin in community college are less likely to finish even though their choice makes a bachelors degree more affordable. I expect that it increases other issues with transfer credits, social and academic transitions, and academic preparation. The other issue I have noticed this year in my kids' high school that I have not seen anywhere in this discussion is how the incentive to start in community college negatively effects what students do in high school. I have seen capable high-school students avoid challenging courses and make lackluster efforts in academics, and they admit the reason is that it doesn't matter for admission to the local community college. Students with ability and financial resources are discouraged from starting at 4-year schools, because you can "get the same thing" for much less cost - both in money and in work. No need to worry about taking another math class, an AP course, the SAT, or study for the test tomorrow. Not only does it reduce their learning in high school and preparation for college, it instills bad habits that persist in the future. Admittedly, these are just some anecdotal observations on a small non-random sample of high-school students inspired by the differing educational climate I have observed in California compared to other states I have lived. It's a hypothesis, and I have no idea if there is any serious research that shows that a financial incentive to attend community college can have negative effects on high school academic choices and achievements. And if there is a negative effect, there may be better ways to correct the incentive than increasing community college tuition. Some highlights from Bettina Boxall's extremely interesting and important article. "Sources familiar with the state discussions said that it is likely the department will separate the habitat restoration component from the tunnel proposal and pursue shorter-term operating permits for the new diversion facilities and existing pumping operations. Although the Bay Delta plan included restoration money, it is unclear how the separate restoration effort would be funded or carried out. The plan revisions would represent more than just a bureaucratic change. The agricultural and urban water districts that are the major drivers of the long-planned project were betting that a 50-year permit would stabilize delta deliveries that have been restricted by increasingly stringent protections for endangered fish. Reverting to shorter-term approvals would leave future water deliveries vulnerable to cuts associated with a change in permit conditions. And that raises questions of whether the project is still worth the money to the districts that have promised to pay for the tunnels. "We don't really know what the permitting will be 10 years from now, 15 years from now," said Jeffrey Kightlinger, general manager of the Metropolitan Water District of Southern California, which would cover a portion of the tunnels' cost. "That's the challenge in making sure it's a sound investment. Does it pencil out and still make sense?" I am in rare agreement with Mr. Kightlinger, this change has huge implications for the economics of the tunnels. As I have discussed on this blog and a variety of other issues, the value of reducing regulatory uncertainty is the majority of the economic benefit attributed to the tunnels in the BDCP economic studies. According to this article, the level of regulatory assurance will be massively reduced under the revised plan. The argument was later repackaged by changing the no-tunnel baseline to the "Existing Conveyance Scenario" where exports are assumed to plummet in the future without the tunnels, but remain near current levels with them. 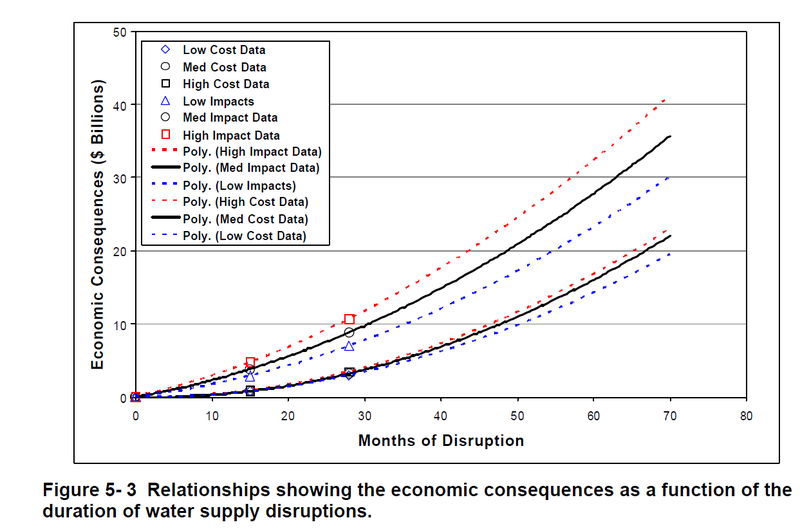 Even with this reframing, the economic benefits of BDCP drop substantially with the impending change to short-term approvals, and risk of significant drops in water deliveries even with the tunnels. Faced with that heightened risk even with the tunnels, it is reasonable to expect that water agencies will make more investment in expensive, less risky water supply alternatives. Thus, another economic justification that has been made for the tunnels - that it will avoid the cost of these investments - is also weakened by this change. The other big change described in Boxall's article is separating the habitat restoration component. This will really help clarify the economic analysis, as the incorrect packaging of the restoration with the tunnels (restoration does not require the tunnels), was a major analytical shortcoming. A bit unrelated, but I read an interesting new article last night in Businessweek about Seattle's troubled tunnel project. The on-line version has fun graphics too and is worth a look by those interested in the Delta tunnels proposal.